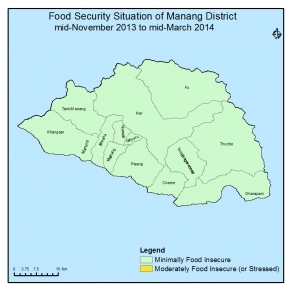 The district (Cluster A: 4 VDCs, B:7, and C:2) is in Minimal Food Security Situation in this monitoring period. The production of major crop maize, wheat, buckwheat, and karu is found to be good. Production of buckwheat is increased by 2% in this year compared to last year. Production of Potato is increased by 5% compared to last year. Since Lamjung –Chame road is functional. Potato has been the source of cash income. Household level food stock was found sufficient for about 4 months for more than 70% hhs. Market stock was sufficient (3 months) to meet the demand of the people. Besides, NFC rice was sufficient. 155.3 MT of rice has been supplied and 0.67 MT of rice was in stock. Price of rice (Jeera Masinu) has been increased by 12.5% compared to last year but it is affordable to the people of this district. There was sufficient income from the Yarshagumba. 124 Kg of Yarshagumba was sold and the price was Rs. 2.5 million from the district. There was 5954 tourist flow in the district from July to November which had been the main source of income. As reported by ACAP, there are at least 210 hotels in the district. The income of a hotel is around Rs. 7 lakh to 20 lakh in this tourist season. There was no significant income from apple in the district. There was Rs. 8 lakh income through livestock and livestock product in this monitoring period. The malnutrition rate is almost nil in the district. There was no occurrence of epidemic and climatic hazards. The water and sanitation situation is good in the district. 98% people have access to drinking water and 55% people have access to toilet. The security situation was normal during this monitoring period. The food security situation is likely to remain same (mimimal food insecure) in the next cycle. Current household food stock is sufficient for more than 3 months. NFC has 0.67 MT of rice in stock and 350 MT of rice is in plan to transport. HHs will adopt traditional coping mechanism such as consumption of food kept in stock(own production and imported). Due to functional road, there will be sufficient food available in the markets. People will be out of the district for most of the time and they will bring back foods when they return from February. There will be no climatic hazards and spread of epidemic diseases. Civil security situation is expected to be normal.